This is number one for a reason. Think of Quality Score as Google pulling out its big red pen and marking up your campaign. Google wants to reward advertisers who are employing best practices in their campaigns. Is this really that important though? After all, C’s earn degrees, right? Not in this case. A good Quality Score can benefit your campaign and a poor one can really hurt it. Quality Score often determines the position of your ad placement, which can lead to more clicks. What are some of the positive effects of a campaign with a high Quality Score? First, and probably most important, a higher Quality Score can reduce your cost-per-click (CPC). Yes, you read that right. As a reminder, pay-per-click advertising charges you every time your ad is clicked. With a higher Quality Score, those clicks just got cheaper. The second major benefit of having a higher Quality Score is that it can lead to higher ad positions. This means your ads have the chance to be displayed higher on the SERP page, leading to a higher likelihood that they’re clicked. We can’t emphasize the benefits of a higher Quality Score enough – better ad placement and cheaper clicks is huge for your business. This is how Google evens the playing field. It allows small businesses to compete with the big box stores who can outbid for premium clicks. If you’re interested in learning more, check out what Google has to say about Quality Score. Your click-through-rate is the heart beat of your campaign. 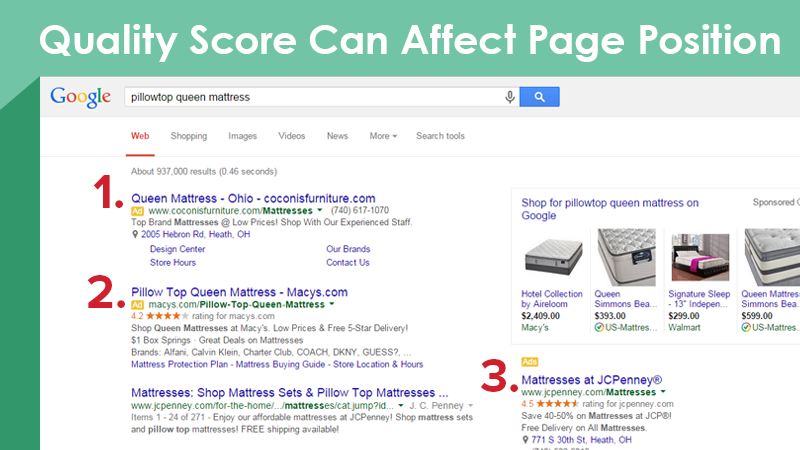 Not only is it a key factor when determining Quality Score, but it tells you if searchers like what they see. To calculate CTR, divide your clicks by your impressions, then multiply by 100 (CTR = (clicks/impressions) x 100). Negative Keywords: These will keep your ads in front of only the most important searchers. In the automotive industry, “body shops” is a popular keyword, but you don't want your ad to show in a search for “body piercing shops.” In this example, “piercing” may be a good negative keyword to consider. CTR is also important when testing your ad and keyword performance. For example, if you’re running a test ad and find that on weekends your ad's CTR is 3 percent better, you have the opportunity to alter your campaign schedule to take advantage of this increased click percentage. Be wary though, CTR percentage change doesn’t always indicate a problem or an opportunity. If you’re interested in how you can further optimize your CTR, give us a call, we have a few ideas. Always keep an eye on click-through-rate, cost-per-click, conversion rate and Quality Score. Conversions are the reason you’re spending money on paid advertising. Whether it’s a phone call, a form submission or even a product purchase, conversions are one of main ways you’ll be able justify your advertising spend. 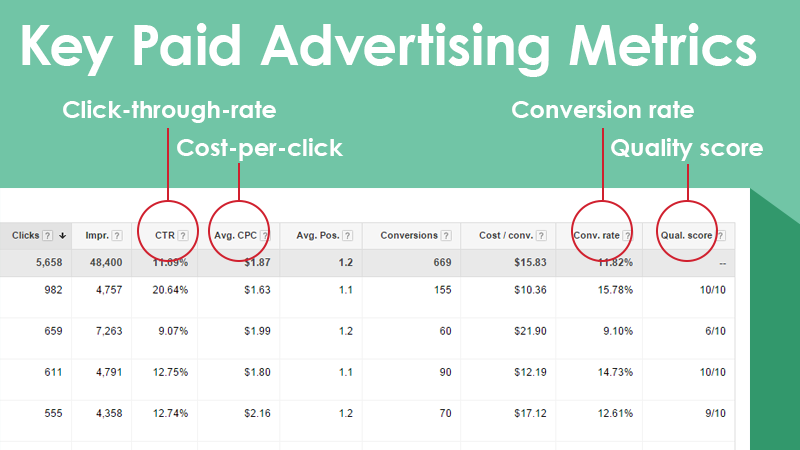 Outside of tracking your total conversions, Google also provides an extremely helpful calculation in its cost-per-conversion (CPC) reporting. This section will tell you exactly how much you're spending to get one conversion. While factors like conversion type and customer lifetime value come into play, your CPC can be very telling. For example, if you’re selling shoes that retail at $50 and your average CPC is $90, you may want to re-evaluate your strategy. To the same effect, if you’re selling jewelry that retails for $1,500 and your average CPC is $250, you're probably rolling in it. All of this sounds great in writing, but does it actually work? In short, yes, but don’t take my word for it. As reported by Google, marketers paid over $59 billion (yes, with a B) to Google in 2014 for paid advertising. Check out this success story from Happy Hounds. As owner/operator Suzanne Golter reports, "Google AdWords generates 90 percent of our business."